'The Dhyani Buddha Akshobhya', Tibetan thangka, late 13th century, Honolulu Museum of Art. The background consists of multiple images of the Five Buddhas. In Vajrayana Buddhism, the Five Tathāgatas (pañcatathāgata) or Five Wisdom Tathāgatas (Chinese: 五智如来; pinyin: Wǔzhì Rúlái), the Five Great Buddhas and the Five Jinas (Sanskrit for "conqueror" or "victor"), are emanations and representations of the five qualities of the Adi-Buddha or "first Buddha" Vairocana or Vajradhara, which is associated with Dharmakaya. They are also sometimes called the "dhyani-buddhas", a term first recorded in English by the British Resident in Nepal, Brian Hodgson, in the early 19th century, and is unattested in any surviving traditional primary sources. These five Buddhas are a common subject of Vajrayana mandalas. These five Buddhas feature prominently in various Buddhist Tantras and are the primary object of realization and meditation in Shingon Buddhism, a school of Vajarayana Buddhism founded in Japan by Kūkai. The Five Wisdom Buddhas are a development of the Buddhist Tantras, and later became associated with the trikaya or "three body" theory of Buddhahood. While in the Tattvasaṃgraha Tantra there are only four Buddha families, the full Vajradhatu mandala with five Buddhas first appears in the Vajrasekhara Sutra. The Vajrasekhara also mentions a sixth Buddha, Vajradhara, "a Buddha (or principle) seen as the source, in some sense, of the five Buddhas." The Five Buddhas are aspects of the dharmakaya "dharma-body", which embodies the principle of enlightenment in Buddhism. Initially, two Buddhas appeared to represent wisdom and compassion: Akshobhya and Amitābha. A further distinction embodied the aspects of power, or activity, and the aspect of beauty, or spiritual riches. In the Golden Light Sutra, an early Mahayana text, the figures are named Dundubishvara and Ratnaketu, but over time their names changed to become Amoghasiddhi, and Ratnasambhava. The central figure came to be called Vairocana. Buddha/Vairocana white ← space → wheel center → all accommodating → rūpa → Teaching the Dharma Turning the Wheel of Dharma → ignorance n/a 法界体性智, Hokkai taishō chi: The wisdom of the essence of the dharma-realm meditation mudra. Karma/Amoghasiddhi green ← air, wind → double vajra north → all accomplishing → mental formation, concept → fearlessness protect, destroy → envy, jealousy summer 成所作智, Jōshosa chi: The wisdom of perfect practice. Padma/Amitābha red ← fire → lotus west → inquisitive → perception → meditation magnetize, subjugate → selfishness spring 妙観察智, Myōkanza chi: The wisdom of observation. Ratna/Ratnasambhava gold/yellow ← earth → jewel south → equanimous → feeling → giving enrich, increase → pride, greed autumn 平等性智, Byōdōshō chi: The wisdom of equanimity. Vajra/Akshobhya blue ← water → sceptre, vajra east → nondualist → vijñāna → humility pacify → aggression winter 大円鏡智, Daienkyō chi: The wisdom of reflection. The five Tathāgathas are protected by five Wisdom Kings, and in Japan are frequently depicted together in the Mandala of the Two Realms and are in the Shurangama Mantra revealed in the Śūraṅgama Sūtra. They each are often depicted with consorts, and preside over their own pure lands. In East Asia, the aspiration to be reborn in a pure land is the central point of Pure Land Buddhism. Although all five Buddhas have pure lands, it appears that only Sukhavati of Amitābha, and to a much lesser extent Abhirati of Akshobhya (where great masters like Vimalakirti and Milarepa are said to dwell) attracted aspirants. ^ Saunders, E Dale, "A Note on Śakti and Dhyānibuddha," History of Religions 1 (1962): pp. 300-06. ^ Japanese Architecture and Art Net Users System. (2004). JAANUS / hokkai jouin 法界定印. Available: http://www.aisf.or.jp/~jaanus/deta/h/hokkaijouin.htm. Last accessed 27 Nov 2013. ^ "Pandara The Shakti of Amitabha". Buddhanature.com. Retrieved 2013-06-14. ^ "Mamaki The Shakti of Aksobhya". Buddhanature.com. Retrieved 2013-06-14. ^ "chart of the Five Buddhas and their associations". Religionfacts.com. 2012-12-21. Retrieved 2013-06-14. Wikimedia Commons has media related to Dhyāni Buddha. Five Dhyani Buddhas - chart of the Five Buddhas and their associations. 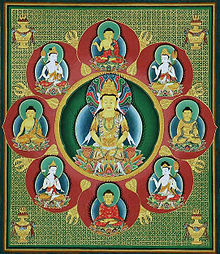 Five Dhyani Buddhas Mandala - Thangka painting of the Five Buddhas.